Continue on to watch the archived livestream here and to see the TGT recap. - Can be used on RTTS character or for editing an existing player's stance. - Tested and designed to avoid collision issues. - Interface designed by Merka. - 1,200 veteran stances to select from as starting points. - Each stance option also given numerical value to allow sharing by community. - Fingers now move on bat; 10 different animations. - 93 new batting stances, 190 redone batting stances, 40 new pitching motions, 70 redone pitching animations, 21 new legend stances, 10 new legend pitching motions, 10 new outfield celebration animations, 30 new generic medium and high intensity home run celebrations, 25 new home run swings for real MLB players, 18 new generic home plate home run celebration animations, 24 new generic home run celebrations in the dugout. - Joined by Kyle Saul to discuss new Throwback Uniforms. - 19 new throwback uniforms added plus uniforms for the three legend teams. - 1931 Boston throwbacks shown. - Three new legend logos shown: Long Ball Beasts, players from 90s-00s. Expansion Era Boomers, players from 70s-80s. Mid-Century Groundbreakers, players from 40s-60s. - No previously existing uniforms were removed, only new ones added. - Merka departs and Stephen Hass joins the stream. - New corporate sponsors have joined The Show, allowing their signage/logos in stadiums including Nike. - Bleachers and bench seating added: Yankee Stadium, Wrigley Field, Dodger Stadium, PNC Park, and Great American Ballpark, among others. - Babe Ruth plaque added to Memorial Park inside Yankee Stadium along with Judge's Chambers in crowd. - Real-life locales added including The Chop House in Atlanta and Hit It Here Cafe in Seattle's Safeco Field. - Backdrops for all real-life minor league stadiums in-game updated. Now 3D images. - New jumbotron in San Diego added to game. New jumbotron in Colorado not added due to time constraints. - Saul departs and Matt Schaeffer joins. - Schaeffer discusses mode he designed, Custom Practice Mode. - Users can create exact scenario they want to play/practice in. - For example, if user struggles against Verlander they can select him as pitcher, put runners on base, selectable count, etc. Can also be set to Repeatable, so game will not advance to next batter. Situation will keep repeating. - Can also load in with Legend teams to play and test out players. - Ratings shown in-stream are not final. - Can tab over to different areas instead of backing out. - Player previews shown before needing to download. - Each of three themes in Stadium Sounds can now sound different. Not applied across the board like in 17. - Music Mode: Users can now skip songs with R3. Music will keep playing even as you load in and out of games. - Nick Livingston crashes onto the couch. - 401 new throws, over 266 new catches, over 220 new tags, over 202 new transitions, over 188 new situational awareness animations, over 316 total new personalized batting animations. - Will be showing rain delay video later. No postponements, no double-headers. - Five new hitting cameras including Strike Zone 2, Strike Zone 3, Strike Zone High. - PCI continues to move after you swing. - Contact & Power Swing both re-balanced. - Changes to game have made Contact Hitters more valuable as compared to the past. - Re-balanced impact of vision on PCI scaling. 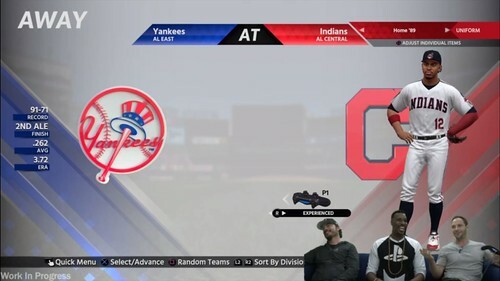 - No rain delays in Diamond Dynasty games. - Bug where outfielders would jog to ball in 17 has been addressed in 18. - Developers play games while answering questions from the Twitch chat. New legend revealed: Current Nugenix spokesman 'The Big Hurt' Frank Thomas.